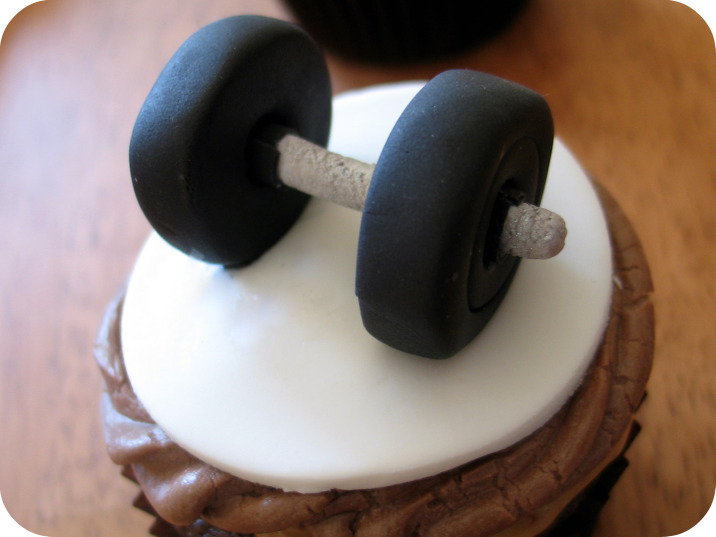 I spent the last day making power-lifting and ballet themed cupcakes for the same birthday party. Why would someone want both of these? Well, let me explain why. Last week one of the trainers at my gym asked me if I would be interested in making her boyfriend cupcakes for a little birthday party she was organizing. 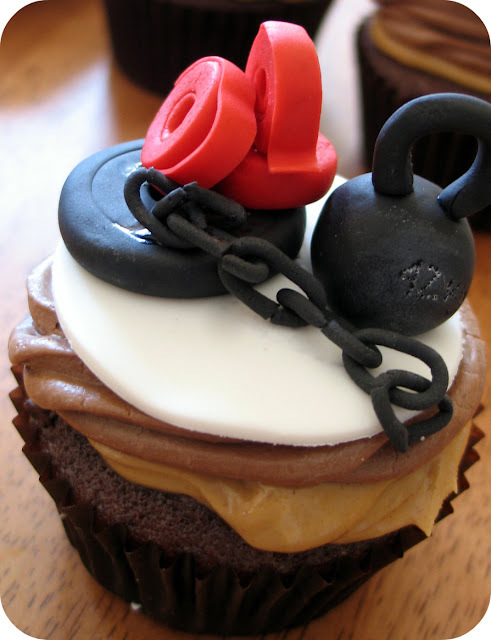 He's pretty big into powerlifting and she knew making gym equipment into something edible would be right up my alley. I was psyched! But then, yesterday afternoon she called me with a little dilemma: there was to be another person at the party who was celebrating a birthday too! 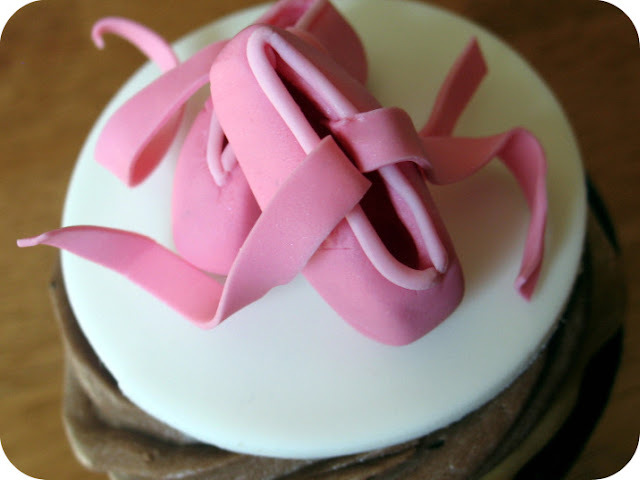 Not wanting to leave them out, she had hoped I could include a few ballet themed cuppies in with her order. I couldn't imagine ever having the opportunity to create such two diametrically opposite themes, so how could I possibly say no? The frosting was a bit of an issue. I followed the recipe exactly as it was written but when I was ready to pipe, it was the consistency of fudge! It was so thick, in fact, that I was not able to get it to even come out of the tip. So to lighten it, I added some soften cream cheese, a bit more vanilla, and a little more powdered sugar. The result was much more frosting-like added a lot to the overall texture. Preheat oven to 350F. Line 2 muffin tins with 18 cupcake liners. Set aside. 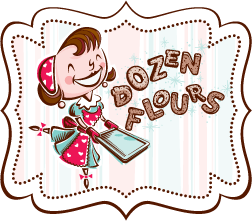 In a large bowl, whisk together the sifted flour, sugar and baking soda. Set aside. Make a well in the center and pour in chocolate mixture. Add vanilla and beat until smooth. Spread batter into prepared pan. In a saucepan, combine 1 cup margarine, 1/4 cup cocoa, water, and 1/2 cup buttermilk in a saucepan. Cook, stirring occasionally, until it bubbles. Remove from heat and set aside. Remove 1 cup of the hot liquid and very slowly, maybe a tablespoon or two at a time, whisk it into the beaten eggs. Continue adding the chocolate liquid to the egg mixture until you've mixed it all together. Pour the chocolate/egg mixture very slowly into the saucepan, whisking the entire time. Turn the heat back up to medium and continue whisking several minutes until the mixture just starts to come to a boil. Remove from the heat and set aside. Pour in chocolate mixture into the flour mixture and mix until well blended and no dry ingredients appear. Add vanilla and beat until smooth - about 1 to 2 minutes. Don't be alarmed at how liquidy the batter looks.) Fill each cupcake tin 2/3rds of the way. Sprinkle a few mini chocolate chips over the top of each cupcake. 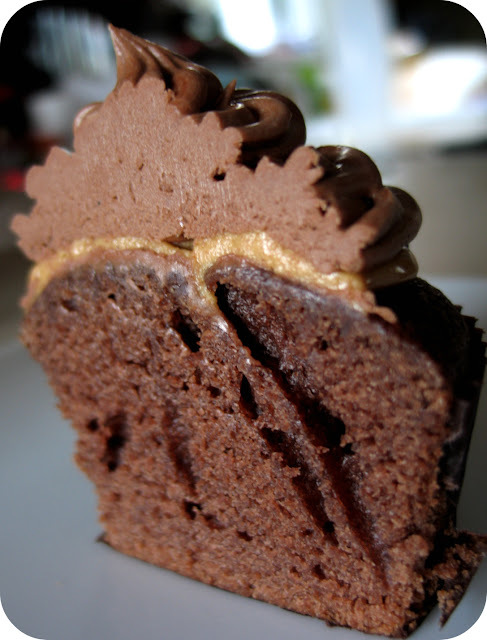 Bake for 15-20 minutes or until the top is set and a toothpick entered into the center of the cupcake comes out clean. Remove from the oven and cool for 10 minutes. Remove the cupcakes from the pan and continue to cool. 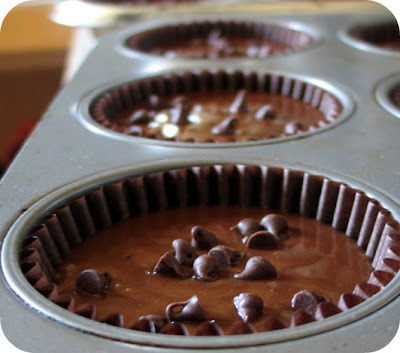 While the cupcakes are cooling, mix the peanut butter and oil together until the oil is absorbed. Add the powdered sugar and the vanilla. Spread a little over the top of each cake. In a saucepan, combine 1/4 cup cocoa, 1/2 cup margarine, salt, and 6 tablespoons buttermilk. Heat just until it starts to boil. Remove from heat and stir in vanilla. Place confectioners' sugar in a large bowl and beat in chocolate mixture. Continue mixing until smooth. Add the cream cheese and mix until combined. If the frosting seems a little thin, continue to add more powdered sugar until it's at the consistency you want. Spread or pipe on each cupcake. Wow! 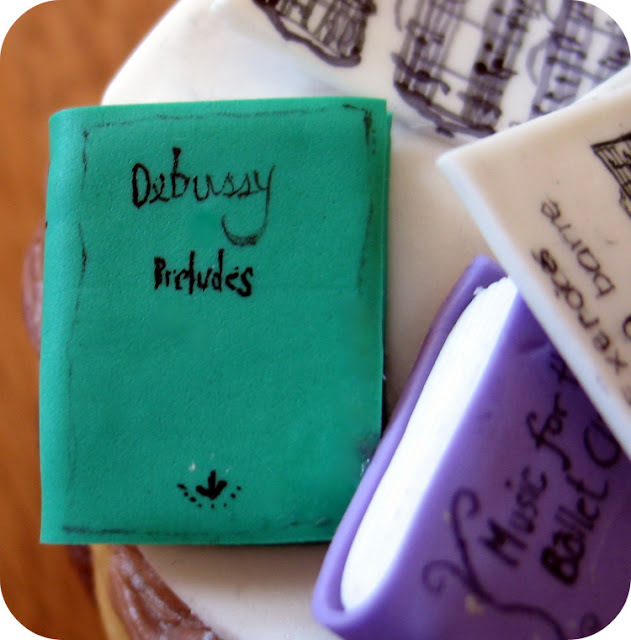 They almost look too beautiful to eat, although I'm sure they were wicked yummy! A true work of art! I love all the detail! So cute! Glad you enjoyed making them! I cannot thank you enough. Shawn and the PNB group loved them. We must of sat around for an hour just staring at them. I ate 3-Ssshhhhh. They tasted so good. Thanks again! You are amazing! 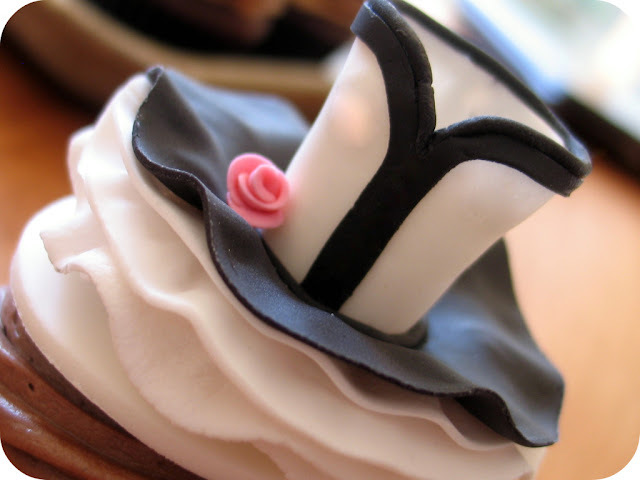 What kind of fondant do you use? Or do you make your own? 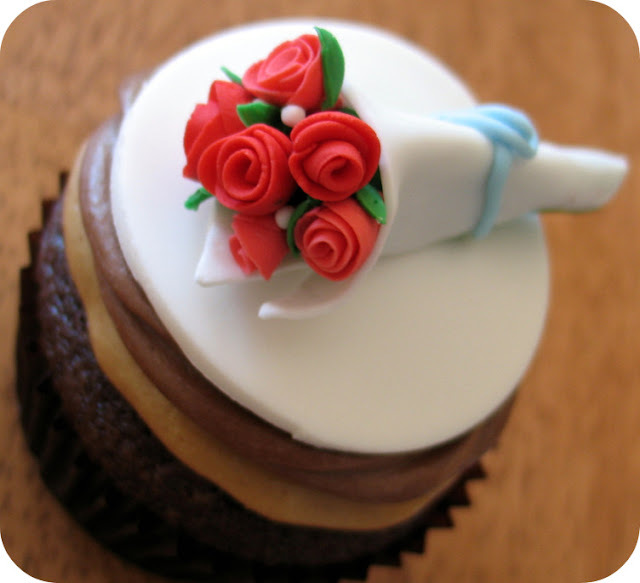 Do you make your own fondant?? You did such a good job with two totally different themes!! Great job! Thanks everyone! Actually I do know how to make my own fondant but it's a little too soft for making these types of decorations. So I use Satin Ice most of the time. It's easy to work with, it is a bright white color, and it tastes pretty good. Unfortunately it can get a little pricey, but a little goes a long way. 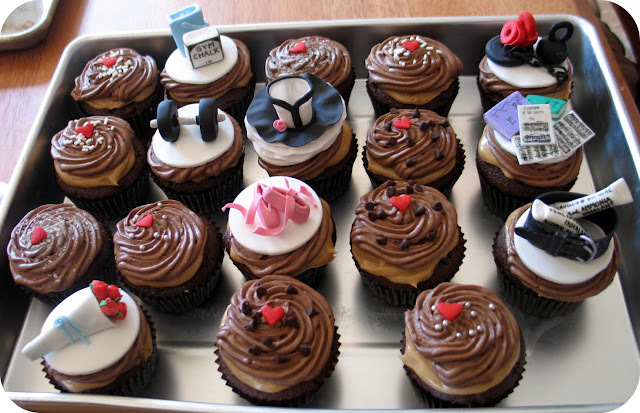 These cupcakes look amazing!! I am not sure I can do your beautiful fondant work, but my son LOVES peanut butter and chocolate and his bday is in a couple of weeks. These will make the perfect birthday treat!! Thanks so much. I just found your blog and I LOVE it!! OMG, those are soooo darling. You really outdid yourself. Gorgeous. This is so creative and fun and beautiful. Yes, title did catch my eye! Ballet shoes and music and all were beautiful! What a talent! I invite U2 my adult ballet classes! Very interesting recipe. I haven't come across this particular technique for making cupcakes. This looks a touch similar to choux pastry. The decorations look surreal! great gatsby, julia! the intricacies of those adornments are just outstanding! i'm tremendously impressed, not only with those decorations, but also with the cake and frosting. what a treat! these are awesome! You've got some patience and talent! How in the world did you make those chain links?!?! AWESOME! Those are the just the cutest! I love the roses. Absolutely pristine craftsmanship. Wow. You are an absolute artist! Oh wow, you have some fierce talent! I love these - they are so cute! And these recipes look like keepers, I have to remember these for when I am on a cupcake-making spree! Those are seriously gorgeous cupcakes! You did an amazing job with the two themes! You've got gum paste skills my friend... for reals! These look awesome. I love that you called them crownies. These are unbelievable Julia! Any ideas for a dessert for an engagement party? Thanks! LOVE it. i'm a former dancer & my husband is a former wrestler so we could def relate to these! too cute! Hey I've been "lurking" here for a little while, but these look amazing!!! My hubby's birthday is in a month, and I want to make these "crownies" into a cake. And I need some advice, I want to make a "game" cake (which models his favorite game) how would you do this? I'm new at decorating cakes, so any advice would be appreciated!!! Wow, these are amazing! The kettlebells and weight belt are my favorites. Nice work! I found you via Donn'a link and I think I just died and went to heaven. These are beautiful! You are so creative! I've gone thru an entire ream of paper printing out your recipes to try minus the decorations since I artistically challenged! I like the idea of powerlifting a ballet dancer actually. Those cupcakes look incredibly delicious on their own and I'd love to make them, but I could never equal your toppings. Wow. The PB Glaze sounds SOOO very yummy! You're so talented. Ijust found your blog tonight and love it! Oh wow - they're adorable! You're very talented! I must add to the what the other commenters have stated. These are awesome!! You did a great job! First of all, that cupcake recipe and the glaze and frosting sounds fantastic and I will add them to my list! They all look positively stunning - I'm sure they were the hit of the party! I'm in absolute awe! I think my mouth was open the whole time I was looking at your slide show. Besides looking fantastic...they look yummy, too! I like how you don't sacrifice the dessert's taste for cute. Btw, I'm sorry I haven't responded to your email. Things have been very hectic. I'm so behind on everything. Oh I made these the other night. without the awesome decorations of course and they were wonderful my whole family loved them. 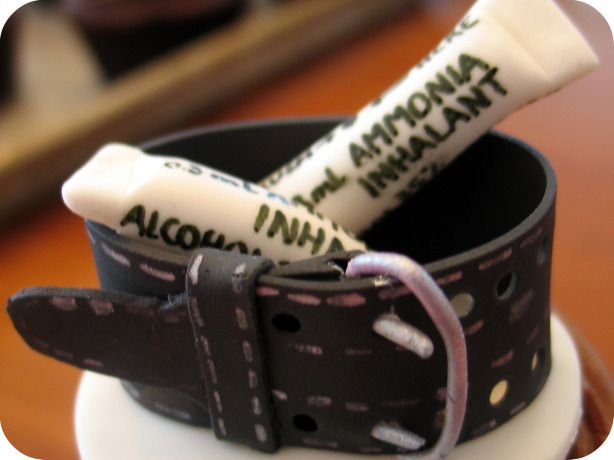 Those confections sure are creative! 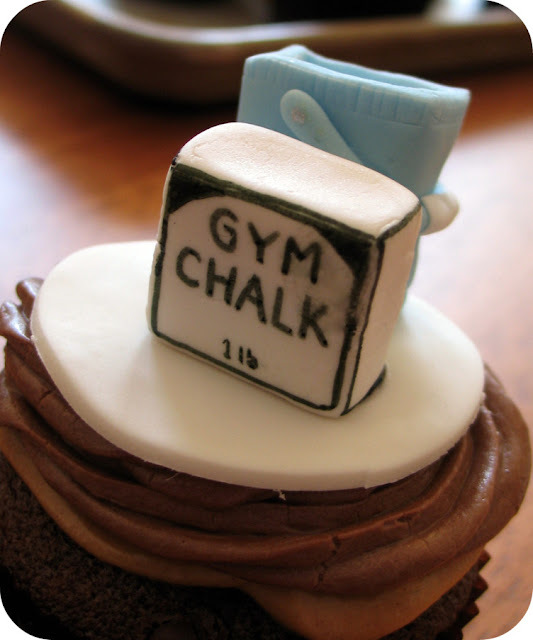 I'm blown away by your fondant work.